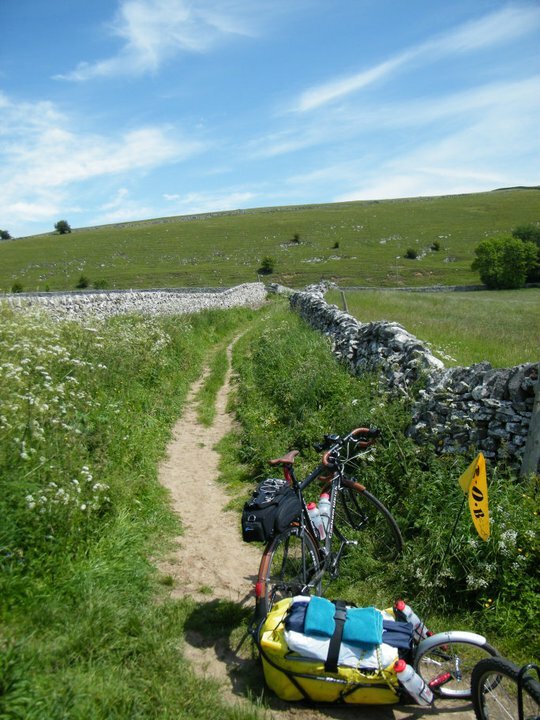 “What could possibly go wrong?” I remember asking my riding buddy when I was planning our 2011 bike tour; we’d planned to tour the midlands, visiting a few breweries along the way, camping every night and taking in as many National Cycle Network routes as possible. 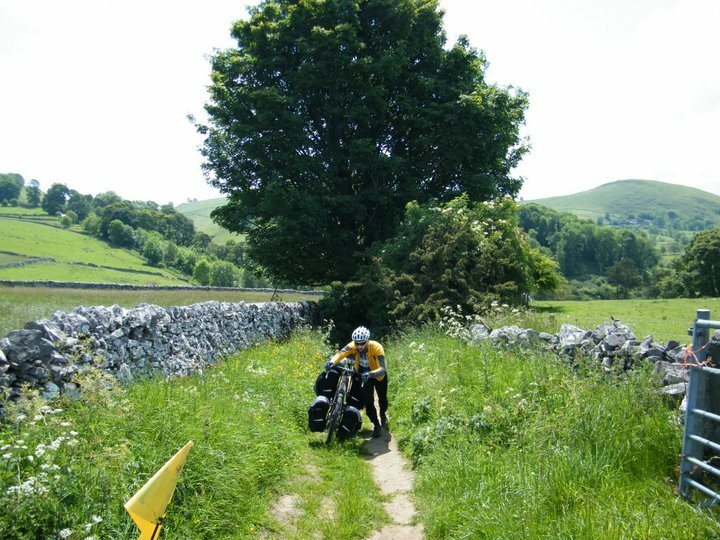 This is a stretch of NCN Route 54, specifically the off road section of the White Peak Trail which follows a bridleway near Hartington, Derbyshire. This is officially the first (and probably only) picture taken of my cycling buddy, Geordie, having to get off his bike and push.The reason? Well, what this picture doesn’t do justice to is the insane gradient here which was easily 17% and possibly more. Now, we’ve ridden up 17% (and steeper) climbs before with luggage but what made this one impossible was the surface: it was loose, deep sand peppered with sharp rocks, widly undulating and it never got wider than 3 feet (a lot of it was barely bike width). Kojak (my BOB Yak trailer) and I somehow made it to the top ahead of Geordie and his heavily laden Surly Long Haul Trucker; I think partly because my overall setup is slightly narrower so I was able to blaze a trail through the undergrowth with slightly less hassle. From here, we found some tarmac but things didn’t improve much… the gradient just kept increasing and so did the pot holes. Just up the road from here is the rather obscure and very out of the way Whim Ales which really isn’t the kind of brewery you just turn up at on your bike, pouring sweat and totally exhausted; they’re just not set up for visitors, tastings, sales or anything like that. Bless them though, they did take the time to show us around and even gave us an old wine bottle full of one of their beers, Flower Power, which we drank with earnest at the campsite several hours later. Most of what we rode on route 54 was just lovely and, as you can see, the scenery is some of Derbyshire’s finest but that Bridleway just shouldn’t be signposted as part of a cycle route. I wouldn’t like to ride it in reverse on a proper mountain bike… For shame, Sustrans; for shame.